If you had told me a few months ago that TechyDad would ask me to buy him body wash, I would have laughed in your face. Long ago, he told me that he did not like the slimy (purely technical term here) that they left on his skin. He did not think that it made him feel clean. This all changed back in March when he did a review with me for the Dove Men + Care line of products. Just the other day, TechyDad asked me to buy more of the Dove Men + Care body wash because his current was nearly empty. It was nice to hear that he found something that he truly liked. So when I was asked by someone to receive a Dove Men + Care Father’s Day comfort pack, we said sure. Once again, it arrived with an active clean shower tool, a container of body wash and some of the bar soaps. 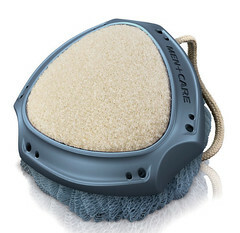 TechyDad was thrilled to have more of the body wash and another of the scrubber since he thinks it does a great job cleaning his skin. 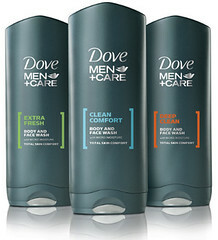 Dove introduces, MEN+CARE, the brand’s first-ever product line created specifically for men. The new products are designed for men who have a reached a point in their lives where they are comfortable with themselves, but not in their skin. Many men put up with cleansing products that are harsh and drying, without realizing these products leave their skin feeling dry, irritated and uncomfortable. Men even blame their socks for their skin irritation when it is really the drying effect of regular cleansers! Dove developed MEN+CARE so men can literally be comfortable in their skin. Built on the Dove brand’s heritage in cleansing, moisturizing and care, the new MEN+CARE products offer great cleansing combined with Dove moisturizers to provide total skin comfort. Dove MEN+CARE is dermatologist recommended and clinically proven to fight skin dryness without irritation or tightness. This summer, Dove has teamed up with well known athletes from the world of baseball including Albert Pujols, Andy Peitite and Joe Girardi to show their Journey to Comfort stories. You can also visit here to see more information about the Ultimate Baseball Experience for a chance to win their Sweepstakes, The sweepstakes ends July 18 (TODAY – sorry if you read this when it is over) will give you a chance to win an all expense paid trip to St. Louis for a once in a lifetime Baseball Experience. The winner will receive a trip for 4, airfare, 2 hotel rooms for two nights, and 4 tickets to a game along with a meet and greet with Albert Pujols. I have to say these commercials really caught my eye. I stopped to watch and wanted to know more about the person and product. Dove really has hit a nice home run on this series! If you have a man in your life that is looking for something new to use in the shower, we definitely recommend Dove Men + Care here and will be buying more soon. Disclosure: We received a Dove Men + Care Father’s Day Pack described above from Rocket XL to facilitate this review. No other compensation was given and all opinions expressed in this review are my families own feelings about the products.